This post is about a very interesting talk that was given by Joshua Klein on Crows and their intelligence, on the TEDtalks website. It has particularly fascinating information for Astrologers, as the crow has a symbolic association with the planet Saturn, and this video unintentionally demonstrates that affinity very well. The nine planets in Jyotish are said to produce all the many things in the world and in nature by mixing and blending their influences. Each planet is a “karaka”, or producer, of a particular concrete thing in someone’s life. For example, Saturn “produces” one’s servants. So in ancient times, if a King wanted to know how his servants would be, and whether they would work honestly and dilligently, or whether they would be dishonest and lazy, the skilled astrologer would look to the condition of the planet Saturn. The astrologer would look at other things too, but the producer of that correlating archetype in the physical world is very important. For learning about the King’s soldiers or ministers, we would look to Mars and Venus, respectively. There are many other factors the astrologer would look at, but this is perhaps the most important. Another way to say it is that one has to look at the planetary archetype that matches the physical entity in one’s life and “as above, so below”. So if there is a difficult Saturn “above” in the heavens at this king’s birth, then there will be difficult servants “below” in this person’s experience of an earthly incarnation. This is a foundational concept in the occult sciences in both the east and western cultures. It can be a hard thing to comprehend, so if it is difficult to grasp, just imagine it for now. If you study astrology, then you probably know that crows relate to the planet Saturn and should watch the video first and observe the similarities yourself. If not, then you can read this list of congruencies and hopefully begin to appreciate this connection. To begin with, the speaker, Joshua Klein, has a simple, intelligent, and capable look to him. These are the qualities of a strongly placed saturn. He wears a black t-shirt without a logo. Saturn is related to the color black, and is mythically said to have a black or dark complexion. He even tells a bit of a “dark” joke about the Alfred Hitchcock movie, The Birds. These traditions of Saturn relating to the color black is still evident in the Jewish tradition, where on the holy day, the Sabbath, they traditionally where black. The Sabbath is Saturday, which is the day of the planet Saturn. The spelling makes it obvious, but all the days of the week are actually related to the planets. He says that he began his interest and research in crows when a friend at a cocktail party tells him that they are useless and should be killed. His very saturnian response to it is that they could probably be trained or used in some way that is more helpful for human life. This is very evident of a strong Saturn, while Joshua’s friend displays the typical pessimism of a poorly placed Saturn, Joshua says “no”, and decides to think differently about the matter. Saturn’s astrological role as a planet is to help that person become who they need to be so that they may do what they need to do to help the world the most. So right away Joshua is looking at what could be viewed as an annoying pest, and seeing how it could potentially be turned into an animal that actually makes life more bearable and enjoyable. At about 3 minutes into the video, he shows an amazing clip of a crow bending a metal wire into a hook to get a worm out of a tube in a science experiment, which the crow had never seen done before, showing great ingenuity and inventiveness. At 4 minutes in, he states that the brain of a crow is in proportion to the brain of the chimpanzee. Saturn is found well placed in the charts of Inventors and people who are somehow improving the quality of life for everyone. The clip of the crow at the five minute mark, with its clever trick of letting the car crack the nut for it, demonstrates patience, a key attribute of Saturn. Taking 30 years to go through the zodiac, it is the slowest of the main planets, symbolizing patience and endurance. A squirrel would never be able to wait that long. Also, it is said that the difficult karma that Saturn brings out in a chart can tend to afflict one the longest, because of its slow movement through each sign over 2.5 years. Sounds familiar to the story about the crows hassling the scientists, and remembering them even months and years later! He makes a strong point overall about how crows seem to actually benefit from cleaning up our human societies messes and roadkill, and that when trained can actually help us clean up debris from events or find lost change. Saturn’s role in the medical aspect of astrology is quite similar, ruling the immune system. Saturn is the planet that is responsible for removing waste from the body, keeping off disease, and is said to rule our longevity. Here we see evidence that crows are cleaning the city streets in an analogous way. 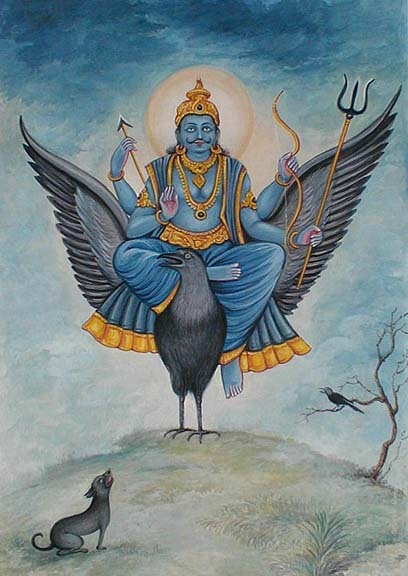 Overall I think this video is fascinating even without respect to Jyotish, but for those with interest in astrology and mythological symbolism, you can see there is much to be appreciated between the Crow and the planet Saturn. And by appreciating the symbolic value of our environment and the life around us, we can feel more like we are a part of something greater than our little self. In this way, mythological symbolism can have therapeutic properties for our minds. If you notice any other interesting astrological correlations between the behavior of crows and the symbolism of the planet Saturn, please share below in the comments section. Photos: Mythological image of the graha Saturn, said to ride upon a crow or vulture. Maybe we can do some kind of Saturn/Crow collaboration project in the future. A book maybe or a series of videos, a course on Saturn perhaps? Just a thought… love your site! Glad you liked it! I would love to do a collaborative crow project, I wonder what the best medium would be for that? One thing I want to do is an article like this one, but based on a wonderful documentary called A Murder of Crows I believe. You may want to watch that, its so easy to appreciate all the connections they unintentionally reveal in this documentary…. Maybe you would like to do a commentary with me on this documentary. I am confident that when you or other astrologers watch it they will be amazed at the synchronicities to Saturn. (Pun intended, Chronos (Saturn) being the root of “SynCHRONicities”). I found the movie on Netflix and it’s in my Queue. I’ll watch it and take notes, I really like the idea of doing a “commentary” on the movie, that sounds like a lot of fun I’ve also been thinking about crows as a symbol of Rahu because Ernst Wilhelm says they are Rahu. They are inventive, mysterious, associated with magic, and definitely wild. Maybe we can talk about how they represent both Saturn & Rahu? What do you think of this? Yes I think that would be fun. 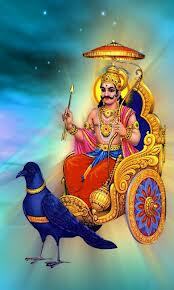 I have never heard of or thought about the idea that they are Rahu but Rahu is very similar to Saturn anyway. I am always open to what Ernst has to say of course! So yes I am open to that. I hope you enjoy that film as much as I did, let me know what you think! I finally saw the movie, A Murder of Crows (there is another film noir movie by the name too, btw) and found it delightful and fascinating. While watching it I got inspired to look up some charts of famous people, such as Tippy Hedren, the star actress of Hitchcock’s movie “The Birds.” Let me know when you’d like to do some kind of fun conversation/video, something-or-other on Saturn/Rahu, crows, ravens, and remedial measures. I’m available pretty much any time. I agree, to take care of the crows is to take care of our strongest karmic energy. It is a traditional remedy to feed the crows on Saturday, in India. So I think you are correct in seeing that correlation and that they need to be taken care of as well. Interesting article , I always look for symbolism in the nature …. As an Indian , we were always told that crows are our ancestors ( Saturn rules elders ) and when ever we would go to visit a family temple crows would come and start cawing …my dad would say …nice the elders have come to bless us !!! As a kid I always felt them to be just stories…. I began observing how intelligent they were …when I would feed them they would carry their food to the water…( Which I placed for all the birds ) wash the food and then eat them …. Maybe it’s to remove the dust or the ants which would stick on …and there would be youngsters too being fed by their parents !! I don’t know if it’s true but I definitely feel an inner peace after I began feeding them …sort of a calmness within ….. But I surely believe that they represent shani !!! Thank you for the wonderful article…. Thank you so much for sharing this as it does make sense and fits with what was written above. Yes Shani is really the planet that gives real deep and lasting peace. So maybe you were feeling that. Who knows! True …..maybe ….who knows .. the universe moves in mysterious ways …. I have a pet crow.he wakes us every single day. He eats food in my house at times next to me. Hi Just wanted share, approximately late December 2016 before my aunt died on 24/12/2017 I had two crows aggressively caw at me when I was outside at work. Since then after my aunts death. As we are now in 2017 the Chinese refer to this year as the fie rooster. I’ve been feeding the crows every day and on Saturdays with key specific dates such as the 8th, 17the , & 26th of every month because it is associated with planet Saturn know as (Shani) and its adds up to number 8. My question is why am I getting such a hard time even though I am feeding the crows for coming to 10 months doing everything above and beyond. I strongly feel now in November 2017 planet Saturn & crows are not showing much of an interest in me as we are coming to the end of 2017. I am now facing obstacles by members of public why are you feeding crows. In the UK I don’t get the English mentality why is it such issue to feed the crows what are they afraid of? Surly if I am feeding the crows rice, bird seeds, & bread in the park. That can only be a good thing or should I say good Karma. How is that a negative? Feeding the crows is a great remedy, but some folks will just not understand why you are trying to do that and why you are trying to improve your karma. It is better to just ignore those people sometimes, and continue with your service to Shani by helping the crows. Shani is always doing important work that must be done, but is often overlooked, like a farmer, or servant, for example. Feeding animals helps them, and in return, they take on a small portion of your karma in exchange for you helping them to survive another day. But remember, that is just a small portion, you may need to do more if you are in a period where you are being afflicted by Saturn. So that is likely helping, but may not be enough. I don’t know what more can I do! because I feed crows everyday! for the past 11 months since this JANUARY 2017 we are now on 16/11/2017. However if Shani causes further problems to me despite by preventing me for feeding his crows then I will feed pigeons the fact I feed his crows everyday especially on SATURDAYS as Saturday is to do with planet Saturn. His key dates are the 8th, 17th, & the 26th. Because as per the 12 month calendar the numbers add up to number (8) for example the 17th if add 1+7 = 8 & 26th if add 2+6 = 8. Therefore factually it equals number 8. I say this truthfully with conviction & assertiveness. As its associated strongly with planet SATURN. I am not a Christian or any other religion. I am 100% In Hinduism Brahmin on SATUTRDAY’S & MONDAY’S I don’t eat meat or drink alcohol. As a firm respect to lord Shani & Mahadev lord Shiva. As I worship mainly Mahadev Lord Shiva everyday. I light 2 deeva’s and I do (108) 4 x saying “Aum numaha Shivya.” by doing the mala everyday at night after midnight because there is no distraction. Vast majority of people are fast asleep so it’s the perfect opportunity in pin drop silence when you say his name and meditate only on him in total silence. reward or punish other humans depending on their Karmic accounts from according to their karmic deeds. Because his father the planet sun pointed him into the right direction. I know we in the iron age as live in Kalyuga and people have their ignorance from different races & backgrounds regardless whether they are male or female………..I get questioned why am I feeding crows? it set in negative way?……….I feeling like saying well why not? my question is how is feeding crows against rules & regulations in the UK or should one say against legality? But if they continue to bother me, in my defence as I religiously follow this ritual everyday without fail and I mean this literally with total honesty. I am happy to carry on doing this until and throughout my whole life or before my death. If this fails and members of public cause obstacles to try and stop me for feeding the crows. I am going find an Indian Tantric black magic teacher because I have seriously had enough of these nasty members of public as I have tried my best. Anyone who crosses my path I will use black magic on those ignorant people as a last resort. Only when they bother me where as enough is enough when I am innocent and haven’t caused them no harm at all. Because I not bothering other human beings in any shape or form. They are bothering me as I am minding my own business not hurting no one intentionally! as all I am doing feeding the crows for my own good as I am not harming people intentionally?………that’s how I see it a deadly as gypsy curse on those who cross my path. Maybe that’s why planet Saturn is making my life difficult because I am destined to learn black magic and use it on those who hurt other people who are innocent or me. LOL! I would not suggest going to a black magic teacher to fix your problems. I would suggest more of a change in your perspective and inner attitude about life and why it is so challenging, and see what you can do to change your life or improve it, regardless of crows or black magic. See how that goes for a while and maybe things will improve? In response to your reply, at the time when I commented it was a time of great difficulty when I was feeling very anxious & unsettled because of these ignorant people bothering me. The truth is negative people come and go. So as far it’s calm because of Christmas time in 2017. Everyone is thinking about Christmas as they are in Christmas spirit to be humble. However I am still going to continue feeding the crows because I see them not just in the park where I feed them. But even at work when I am on my meal break, where I live, & when I am driving. They seem to acknowledge me I watch them they watch me! From an observation point of view it seems like they appreciate me doing my part for their crows community. I feed them because I see this as good karma regardless of what my enemy thinks of me. I pray to the crows as I ask to remove those negative people from my path. Because the truth is I literally don’t bother anyone as I strictly mind my own business. I heard two white women make a comment about me saying “I think he is a witch.”When I heard them say that. It made very happy. Because they backed off & freaked out. I’ve heard other people watch me in the distance when nearly 15 to 20 crows all fly at once towards me when I apply and sprinkle bird seeds to feed them for their needs. I see the crows mother with her chicks in front me feeding them. A few days ago when it was snowing there was a male crows sat on the roof watching me. I immediately thought about him and I gave my remaining Mc Donald’s fries he came and ate them. So I think they trust and like me. I saw two middle age white people smile at me as result of my action they also fed the crows. My plan is to attract lots of crows so that negative people don’t come anywhere near me. I will ask the crows to please let me continue as result of my efforts as I ask that you get rid of these unpleasant people regardless who they are. 2018 will be quite something or it might be just the same, I wonder what will happen to myself from my own actions ? Shani Dev is actually deep indigo blue in colour wearing similar coloured clothes,garlands and gems.As the most powerful planetary deity he also control black as his formal colour of Justice while his own deep blue/indigo colour denotes devotion. Shani Dev is actually deep indigo blue in colour wearing similar coloured clothes,garlands and gems.As the most powerful planetary deity he also controls black as his formal colour of Justice while his own deep blue/indigo colour denotes devotion. Rahu on the other hand is Shani’s personal agent who takes care of Shani’s personal properties such as blue colour itself.That is why inspite of being a colourless shadow it is influenced by Shani’s blue colour while Shani as a neutral hard task-master signifies his formal colour black.That is why Rahu is considered blue and Shani black.